In the virtual reality installation Enter the Real visitors are faced with the murky boundaries between the “real” and virtual world. By cutting off the tangible reality of the beholder, but let him physically run through it, the physical and virtual experience came together. By wearing the Oculus Rift (virtual reality headset) the consequences of the disappearing boundaries between real and fake are investigated. The visitor enters a virtual space that is filled with scanned images of people. It looks full, but because you can walk straight through the spatial images and you hereby feel no resistance (only the sound of crackling paper), the space is actually empty. Upon searching the area, you’re suddenly looking at yourself. In a mirror placed in the virtual space, you will see yourself with the Oculus Rift on your head. 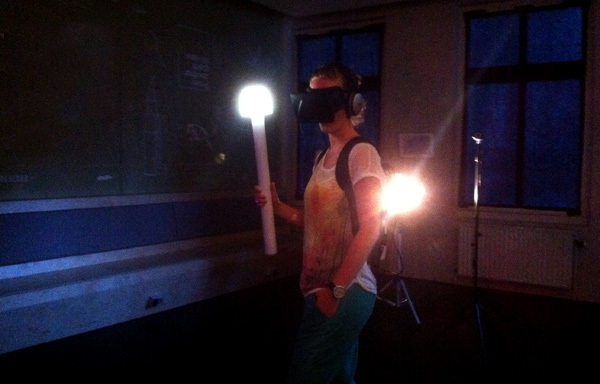 Enter the Real was shown at the Art and Science Night, in Groningen on May 24, 2014. The 3D scans were made in collaboration with 3DMij .